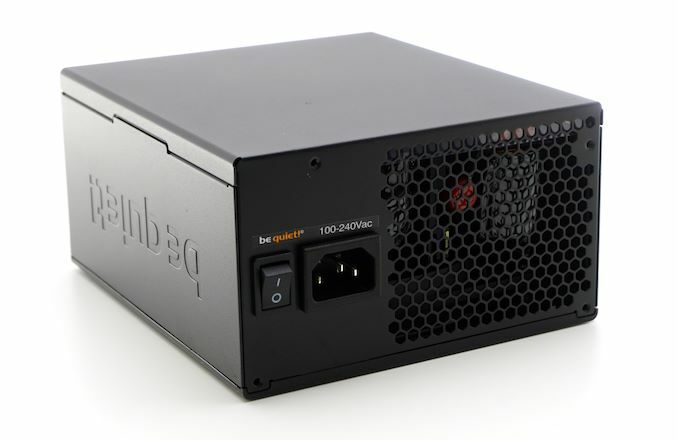 The Straight Power 11 750W PSU sports a relatively subtle all-black appearance but with several distinct features that distinguish it from a common ATX PSU. The most prominent differentiation is the bottom panel of the chassis, which is a separate part from the metallic chassis. This part is made mostly out of plastic, with parallel metallic wires serving as the fan's guard, and is designed so as to reduce aerodynamic noise via its funnel-shaped intake and low resistance air intake. 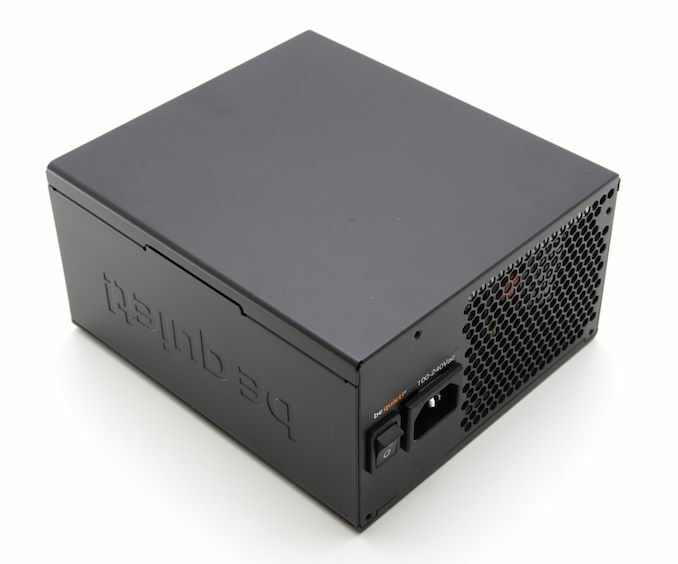 The chassis measures 170 mm deep and is slightly longer than that of a standard ATX PSU, which should not be an issue with any modern ATX-compliant tower case but it will prevent the Straight Power 11 750W PSU from fitting inside compact case designs. Be Quiet! embossed the company logo on the left side of the chassis, which is the side that will most likely be visible from a windowed side panel. The sticker with the unit's electrical specifications and certifications can be found on the right side of the chassis, while the top side is entirely clean. 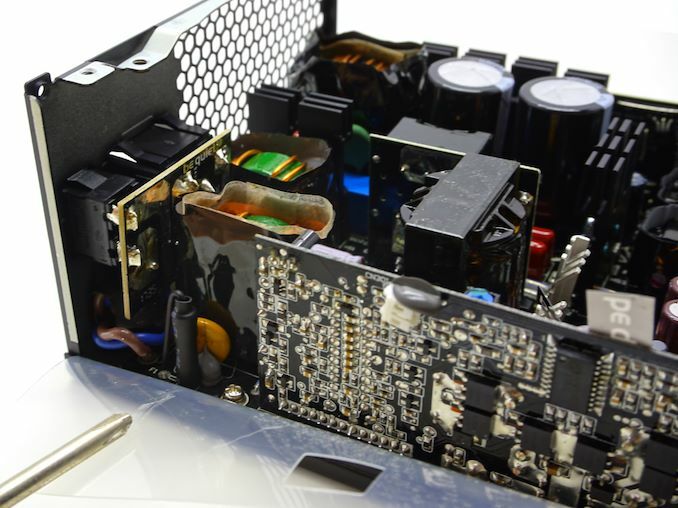 On the partially perforated rear side of the Straight Power 11 750W PSU we can see an AC cable receptacle and a small switch. The front side of the Straight Power 11 750W PSU is filled with the connectors for the modular cables. Be Quiet! is using a straight 5-pin connector for the SATA/Molex cables and dual row 12-pin connectors for the PCIe and CPU 12V cables. Even though each group consists of physically identical connectors, users should be careful not to connect the cables randomly, and instead follow the suggestions in the manual. 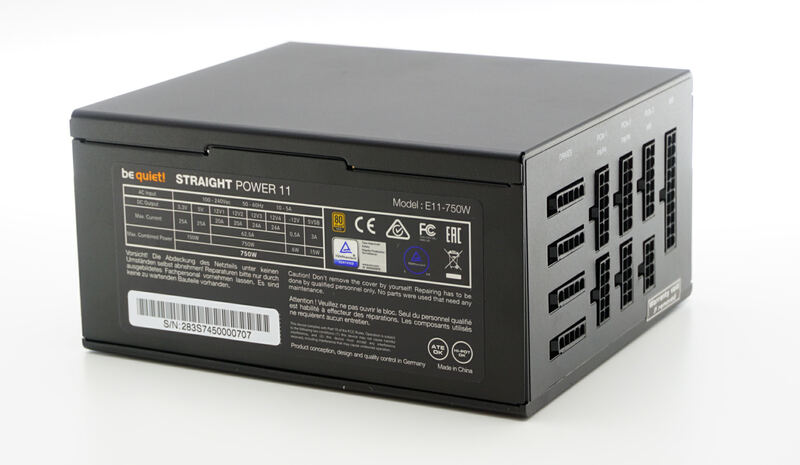 Because the Straight Power 11 PSU features multiple 12V current rails (or at least multiple overcurrent protection triggers), the PSU will shut down if the load is improperly balanced. Meanwhile the ATX cable connects to two connectors at the PSU's side, a large 20-pin connector and a second 8-pin connector. The fan beneath the fancy finger guard of the Straight Power 11 is one of Be Quiet! 's own SilentWings fans. 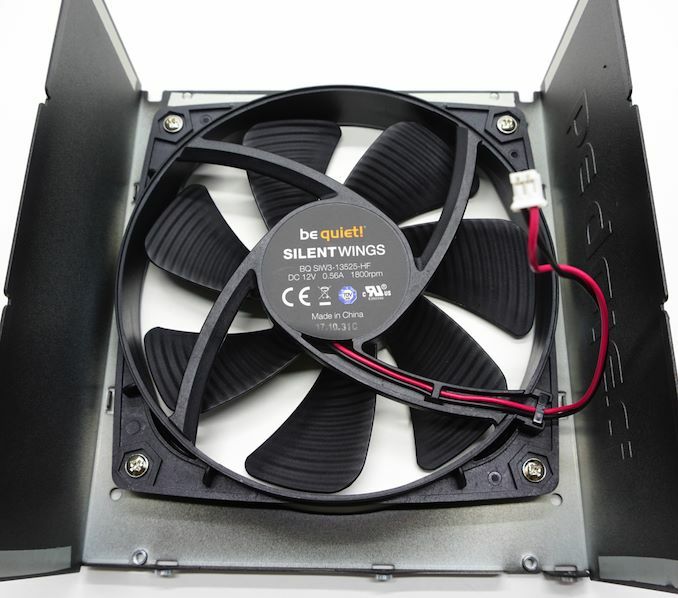 It is a very high quality fan, featuring a fluid-dynamic bearing (FDB) engine and custom "ribbed" wings for the optimization of airflow and lower noise output. The maximum speed of 1800 RPM is high for an 135 mm fan, so hopefully it won't reach quite such a high speed during normal operation. Be Quiet! 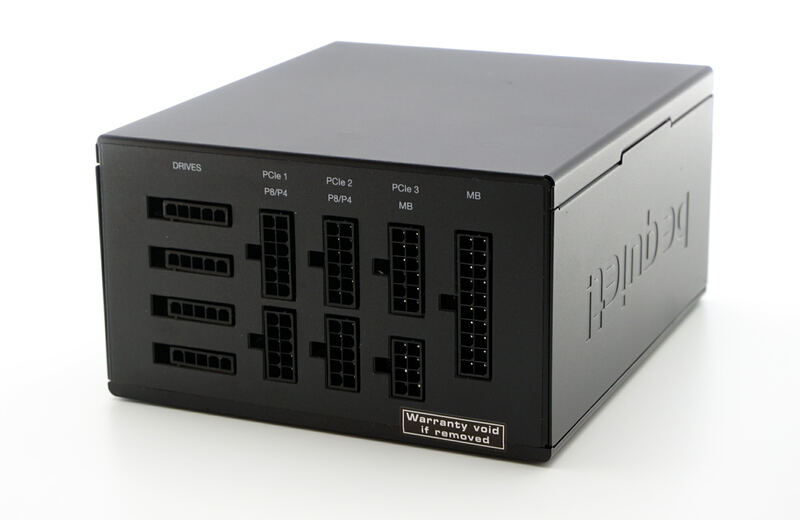 employs several OEMs for the design and production of their PSUs. The OEM behind the creation of the Straight Power 11 PSU is FSP Group, a company known for their advanced and cost-effective designs. This particular platform does not match any of the company's reference designs that we have seen to this date, meaning that it probably is exclusive to Be Quiet! and their Straight Power 11 series. The sticker with the company's logo should be on the main transformer of the design but the unit obviously heated up a bit too much during our testing, as we found the sticker floating around inside the unit when we opened it up. That probably is why OEMs do not use stickers to brand/rebrand anything inside any electronic device that will potentially get hot during operation. 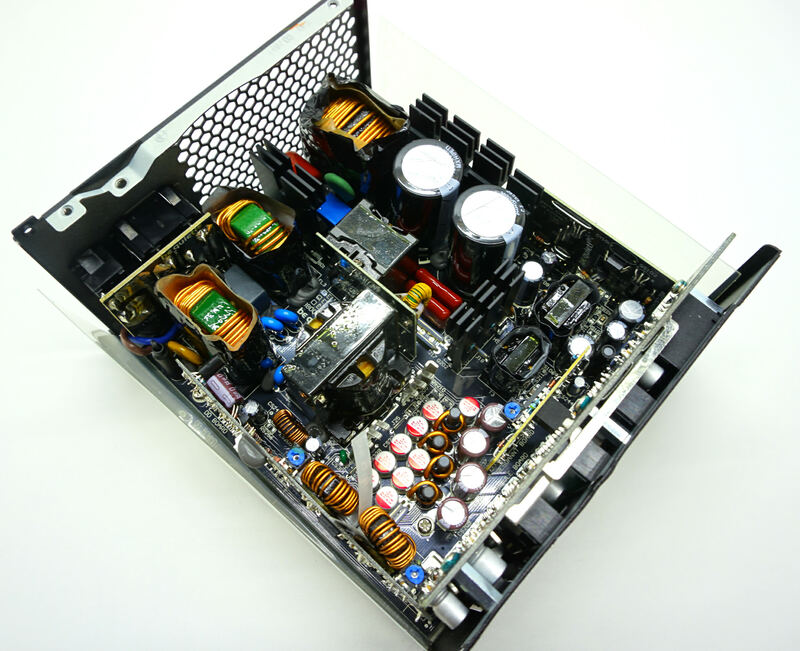 As advertised, there are (almost) no wires inside the Straight Power 11 750W PSU, as the main and secondary boards are all physically directly attached to each other. The only exception are two AC wires going from the partial input filter found at the back of the AC receptacle down to the main PCB. We found a textbook filtering stage with a total of four Y capacitors, two X capacitors, and two filtering inductors leading to a single input rectifying bridge attached to its own dedicated heatsink. The large filtering inductor and two Rubycon 420V/330μF capacitors are the passive components of the APFC circuit, while the larger heatsink near the edge of the main PCB holds the active components, three transistors and a diode. Two MOSFETs are the active components of the LLC resonant half-bridge primary inversion stage. The secondary side MOSFETs that generate the single 12V line are placed on the underside of the PCB, with thermal pads assisting their cooling by transferring a portion of their thermal losses to the chassis. 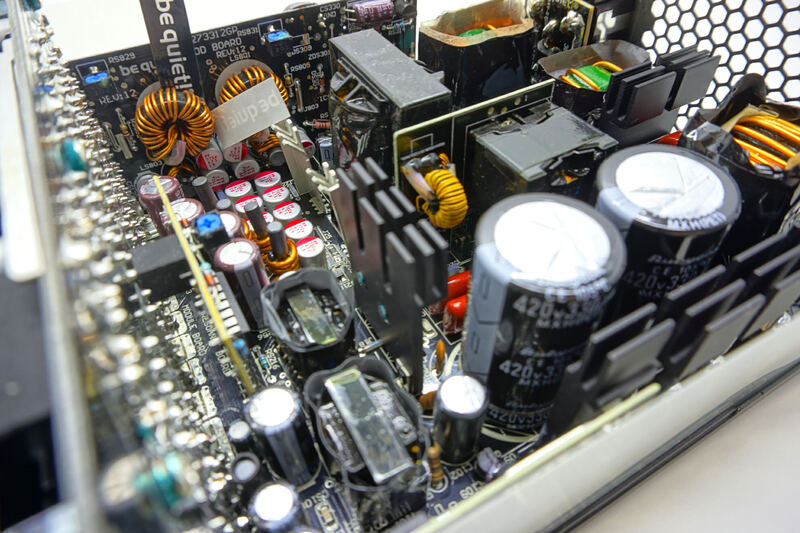 The two silver heatsinks that can be seen near the main transformer cover most of the cooling needs of the secondary side MOSFETs. The 3.3V and 5V lines are being generated “on-demand” via the DC-to-DC conversion circuits found on the large vertical PCB at the edge of the unit. Most of the secondary capacitors on the main PCB are electrolytic, a mix of Rubycon and Nippon Chemi-Con products, but there are a few Nichicon polymer capacitors on the main PCB as well. Nichicon supplies all of the polymer capacitors found on the main and secondary boards of this design. Thanks for the review! I generally like BeQuiet stuff. I have a Dark Rock Pro 2 that I bought used for cheap as my CPU cooler and a Straight Power E9-CM 480W PSU that I also bought cheap used. That gives me a pretty much silent PC in combination with a Core i5-4570S @ 1V @3.6GHz and a 960 GTX graphics card. This seems to have missed its mark a bit, they are usually pretty good about the noise levels. Their Dark Rock Pro coolers trade blows with Noctua ones while usually being a bit quieter. One thing I would like to ask about this statement: "the efficiency diving below 75% when the load is lower than about 40 Watts." Will you be able to maybe give us an article detailing idle power consumption of current generation (maybe even older generation) hardware, to see how relevant such a deficiency is? 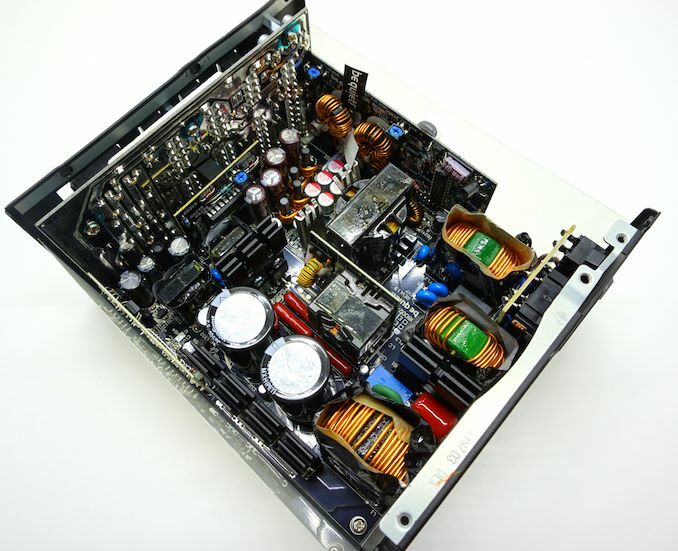 If I were to buy a 750W PSU, it would be for a top of the line overclocked 8 core CPU and a smiliar, top of the line overclocked GPU. A reasonable overclock on air would likely still mean the system draws less than 500W with a handful of HDDs/SSDs and no weird stuff. What would be the idle power draw of such a system. Maybe compare an overclock via offset to one via fixed voltage? Is 40W a reasonable target for idle power draw of modern, high end systems? How are the default BIOS settings regarding power saving mechanisms set? My old PC (i7-860, GTX 670, 8 GB DDR3 1600 MT/s, two SSDs, one HDD, 1 cpu fan, 2 case fans) idles at 35-40 W. According to this article https://www.anandtech.com/show/11180/the-nvidia-ge... their system with a GTX 1080Ti idled at 76 W. Other newer systems out there seem to idle at ~90-95W (which I find a bit too much). On Amazon.de: the be quiet! Straight Power 11 750W is €125, the Corsair SF-450 Platinum costs €108, but it's a 450W PSU. The 600W SF-600 Platinum costs €120.